I have been on blog silence for three months. I know. I know. You’re not supposed to go on blog silence, but since my whole intent with starting Writing Shed was to change my story, I’m giving myself permission to make my own rules. I go silent when I don’t know what to say. These past three months have not been easy ones. Tom started radiation in July. Each treatment lasts 10 minutes and we are about 10 minutes away from the facility. So treatment and round trip amount to about 30 minutes a day, five days a week. He has 10 more treatments. Doesn’t sound like much—30 minutes a day. Radiation doesn’t have the noxious effects (they aren’t side effects, they are effects) of chemotherapy. And yet, it has been a period of endurance for him. I am on the sidelines watching it. Helpless to do anything to make it more endurable as he prepares five days a week to do what he can to protect his bladder and bowel from the noxious effects of radiation. Every Monday he meets with the radiation oncologist where he is asked questions to determine if he is being affected by the treatments. Any trouble urinating? Any pain urinating? Any diarrhea? Any fatigue? No. No. No. And yes. Being hyper-aware of one’s bodily functions is exhausting. There was something sobering about Tom starting the treatments. It made his diagnosis real. And then two weeks ago, we learned that it will be about a year and a half before we find out if the treatments are indeed curative. Six-month intervals of PSA tests. And even then . . .
That’s the reality of a cancer diagnosis. Once it enters into your home, it’s there as a ghost—if not an actual presence. It’s the new normal—the realization that there is an end parenthesis, even if it isn’t punctuated with cancer. One never knows when it will come or how it will come or if it is your end parenthesis or an end parenthesis that leaves you the one left behind. We all have that end parenthesis hanging out there. It’s just that it’s a bit more in our faces. For me, it has made me wonder, why did I, a native Californian, end up in the Pacific Northwest for this journey into the wilderness? The theatre group we threw ourselves into turned out not to be our tribe. It tends towards the cliquish, and Tom and I are the opposite of that. We didn’t fit. It was a loss on many levels, including losing a feeling of belonging. His diagnosis intensified our feeling of loss and isolation. So why here? Why now? What? Turn left at the whale. That was the instruction I received to locate the Marketing Your Small Business class offered by the Jamestwon S’Klallam Tribal Library. The photo at the top of this post is the whale at which I turned left. The culture that was here before Europeans arrived, the Jamestown S’Klallam Tribe, is strong here. I want to say that their artwork is pervasive, but I think referring to it as artwork doesn’t quite fit. It is a work of being, rather than something that is done. In June, a totem pole that tells the story of why the sun shines in Sequim was installed in the new Civic Center plaza. 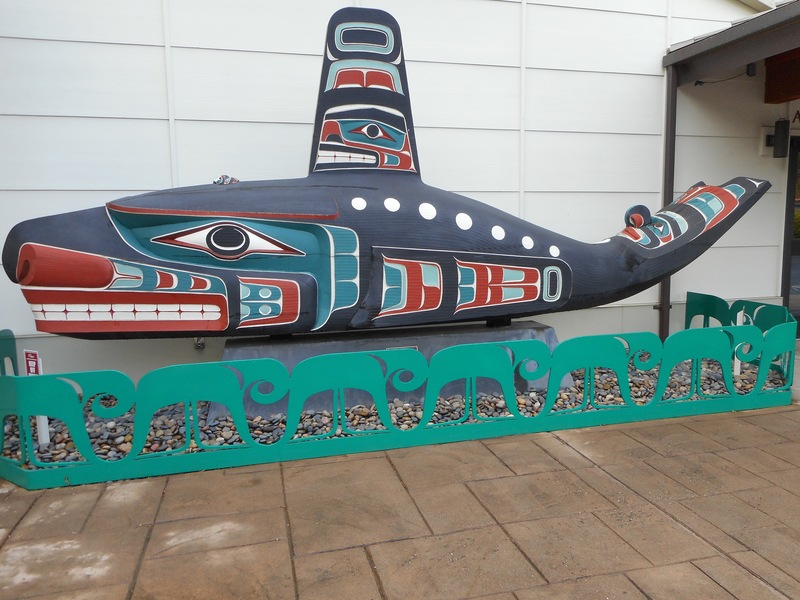 I had stopped by the House of Myth where the carvers were working on the totem pole so had seen it as it transformed from a piece of wood into a story. The dedication included a ceremony conducted by the tribe. As I listened to her last night, the answer to the questions, why here, why now, and what washed over me. I live in a place that is a reminder of being. A place where the original inhabitants derived their spiritual essence from the environment that surrounds them—who recognize that the end parenthesis is a part of being. The new normal that was actually the normal all along. It just comes with eyes that see more clearly, ears that hear more perceptively, and a heart that feels more strongly. Turn left at the whale to discover your human being. I cannot leave this post without thanking Renee Emiko Brock-Richmond, who taught the class, for her gracious and generous spirit. Check out her website. This entry was posted in Following your bliss, Living, On Being Authentic, Writing and tagged cancer diagnosis, S'Klallam Tribal Library, S'Klallam tribal stories, Sequim civic center totem pole, Why the Sun Shines in Sequim. Bookmark the permalink. Oh, my. I feel weird saying this is a beautiful post — even thought it’s haunting and makes me sad — but it is a beautiful post. Love to you both. You’re a remarkable writer married to a remarkable musician. I feel guilty getting to experience the beauty here, but I do. Thank you. I’m sorry we only got to meet you so close to when we left the Bay Area. It means a lot to me that you like my writing. Thanks for sharing your story with us. We’ll keep you in our thoughts. Truth is karen, for me at least, we’re all goners sooner or later. Since I don’t subscribe to any of the afterlife nonsense (garbage really) and don’t plan on converting to any of the fairytales true believers swear by (pick your messiah and his instruction manual — notice how it’s always a male never a female) (and by the way — how old were you when you stopped believing in the Tooth Fairy?) my position is this: Hey folks, this is all you get. Sorry. Appreciate every single moment you’re alive to the max now ’cause when you’re gone you’re gone. And going is no big deal anyway. As the saying goes, “Life — no one gets out alive!” Wait. What? There is no tooth fairy? Turn Left at the Whale is a pretty powerful statement my friend. Here is a short story about the whale.